Set in good-size gardens within this quiet residential area on the edge of the village providing well-planned four-bedroom family accommodation with two living rooms and conservatory, sensibly priced and warranting viewing. Hall: - With glazed panelled entrance door, radiator and staircase to the first floor. Conservatory: - 6'6'' x 8' av. (1.98m x 2.44m av.) - A timber double-glazed conservatory opening to the rear gardens. Kitchen: - 10'6'' x 7' (3.20m x 2.13m) - Fitted with range of modern-style units with worksurfaces, tiled surrounds, sink unit, built-in oven, hob and extractor, ample power points, radiator, understairs cupboard and glazed door to the side. En-Suite Shower Room/Wc: - Tiled and having shower cubicle, wash-hand basin, WC and heated towel rail. Bedroom 1: - 8'9'' x 12'7'' (2.67m x 3.84m) - To the front of the property with radiator, laminate flooring and built-in wardrobes. 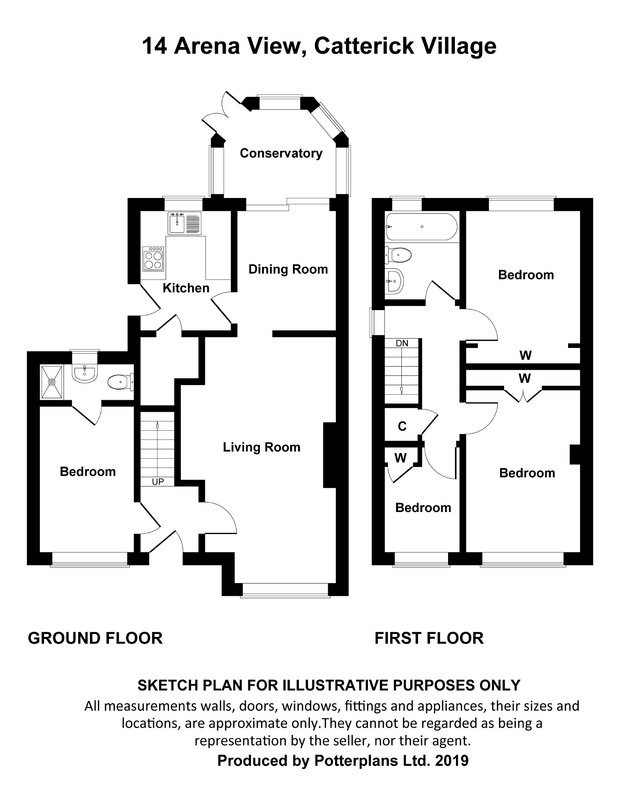 Bedroom 2: - 9'1'' x 8'9'' (2.77m x 2.67m) - Overlooking the rear gardens with radiator, airing cupboard and wardrobe area. Bedroom 3: - 6'11'' x 5'10'' (2.11m x 1.78m) - A good-size single bedroom again to the front with radiator and overstairs cupboard. Bathroom/Wc: - 5'9'' x 6'3'' (1.75m x 1.91m) - Having panelled bath with shower above, wash-hand basin, WC, fully tiled surrounds and heated towel rail. Gardens: - Lawned garden to the front, south-facing with borders, paved driveway and ample hardstanding. Extensive lawned gardens stretching to the rear with open views, paved terrace area, external lamps, water point, lower shrubbery borders, summerhouse with barbeque area and garden shed. Established since 1978 Charltons Estate Agents are traditional, independent, estate agents based in Richmond, North Yorkshire offering a wide selection of town and country property throughout the region.